What kind of mirror is right for you and your needs? “Mirror, mirror on the wall who is the fairest of them all”. 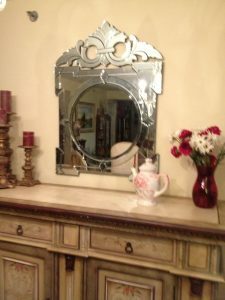 Mirrors can be used in any room of the home, living room, dining room, bedroom, hallways, laundry rooms, etc. 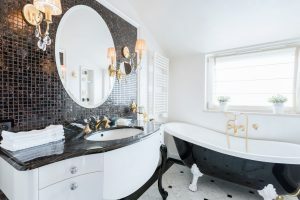 There are decorative mirrors of many shapes and sizes some with gold and silver leaf frames, wood frames with glazing, even with round convex and tulip shaped mirror accents. These enhance the beauty of your home. In the kitchen you may find mirror used as a backsplash to reflect the beauty of the countertop. In the bathroom, instead of a wall to wall mirror, individual decorative mirrors are used over vanities. Some are even designed to tilt down to accommodate people of all heights and can be used in the powder room or bedroom as well. Here we see a fantastic use of an ornate mirror in a living room. Shaving mirror in the shower that won’t fog up is great for the men in the house. For the women, there are vanity top makeup mirrors that are 2-sided with magnification on one side, a halo light and can even be height adjusted. For the family, a wall mounted mirror with the same features, magnification and lights can be very useful. There are ceiling hung mirrors that can be placed anywhere and add dimension to any room. They add a modern touch and can be used to divide a room, example: separating sleeping and dressing areas. Floor standing mirrors can be used in dressing areas and even in the bathroom. Which mirror do you think is the fairest of them all? This entry was posted on Wednesday, February 28th, 2018 at 5:12 pm. Both comments and pings are currently closed.